Is Time Really on China’s Side where the South China Sea is Concerned? Southeast Asia has enjoyed relative peace since the end of the Cold War in 1991. Its major regional body, the Association of Southeast Asian Nations (ASEAN), founded in 1967, was finally able to welcome all the countries in the region as members by the turn of the century. (Timor Leste painfully gained full independence only in May 2002, and its inclusion in the organization is still under consideration). Changes unleashed by the ending of the Cold War were global in character, needless to say, and in East Asia, these were most dramatic in the case of the People’s Republic of China. From being a poor country mired in ideological battles and intra-party conflicts, it rose within 25 years to become the most credible challenger to the one-superpower world order that fell into place after 1991. This is at least how it is notionally understood within the residual Cold War narrative that much of international relations analysis continues to function in. China seems to automatically have taken the place of the USSR, and it is assumedly aiming to replace the USA and become the biggest super power in the world. And an arena where this outdated perspective is applied is the South China Sea. Why is this sea fought over by six nations? 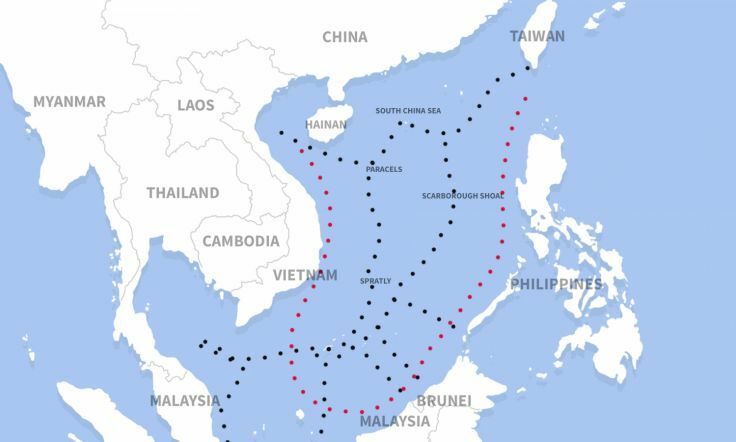 And more importantly for the moment, why is China so actively consolidating its claim and control over this stretch of ocean? Indeed, China seems the undeniably unreasonable party in the equation, given that it lays claims to most of the watery territory through its nine-dash line. Therefore, it is changes in its northern giant neighbor that exerts the most pressure on Southeast Asia’s relatively new and fledgling nations. China is the shaker and mover in the region at the moment. However, for the foreseeable future, much of its motivation, also in international policies, is domestic in essence. Given that China’s present prosperity and power are a very recent, rapid and, even to its own leadership, astounding accomplishment; its sense of security and its self-image is far from being a confident one. And there are clear objective and material reasons why the country’s leadership should feel that way. Already when Deng Xiaoping finally managed to accelerate his reform programme—and this was only in the early 1990s—, certain threatening issues were expected to arise which future leaders would have to deal with. These included serious and widespread corruption stemming from the gigantic jump in national wealth; an imperial size income gap; environmental degradation of unprecedented scale; a huge development gap between the coastal and the inland provinces; a diminished role for the military in light of the heavy economic focus of national policy; and necessary but potentially destabilizing political innovations. China is now in that fretful future. And it is President Xi Jinping who imagines himself the leader to steer his country soundly beyond the rapids, and without losing too much momentum along the way. Allow me to mix my metaphors, but there are a lot of balls for him to keep in the air. While fighting corruption, he has to keep the People’s Liberation Army on his side. And in prioritizing closing the development gap between the provinces to closing the income gap, he has to expand further the means by which Deng had reformed China, i.e. through intensifying international trade. Overproduction may not have been part of the early calculations, but it is nevertheless a serious problem that the system now has to deal with. All this has to be done while China’s contends strategically against an international order potentially hostile towards it. And so, as part of the solution, we see China coming up with a series of huge initiatives recently, such as the One Belt One Road and the Asian Infrastructure Investment Bank. Once could say that, as with all capitalist systems of past decades and centuries, China is held hostage by its own success, and like all hostages, time seems always to be running out. What about the South China Sea? This is frontier territory, conceptually and geographically. From pure size alone, one assumes that China has time on her side in dealing with smaller neighbours, and with the world. But the advantage of size also means that it often does not have to consider the sensitivities of the little guy, or take his protestations seriously. The South China Sea seems important to China for at least three possible reasons: as a vital thoroughfare for its merchant fleet; as a future source of natural resources; and as a sovereignty issue. The first obliges China to support freedom of navigation there, and that normatively aligns with the interests of most other countries. So, no problem. Secondly, most of the oil resources in that body of water are found close to the coastlines of the Southeast Asian nations, largely outside the nine-dash line. And exploiting them requires bilateral or multilateral agreements, and not a show of force. It is perhaps only where the issue of sovereignty is concerned that China can be seen to have time on its side, but it is there that the need to satisfy a military that has been feeling sidelined is best met. The aforementioned dynamics of change within China does in fact impose time limits to its options—in the South China Sea as elsewhere. A further point to consider is that when pressed for time, the weakness of other powers active in the region helps dictate China’s action as much as its internal problems do. « Should We Beware Humanity’s Collective Capacity Reaching Critical Mass?